I’ll preface this piece by stating that I’ve played through Persona 3: FES and Persona 4: Golden multiple times because I consider these two games among the best in the JRPG genre. That aside, I’ve logged approximately twenty hours with Persona 5 since getting it into my grubby mitts, and here are my initial impressions with the game. 1. The plot gets moving a lot quicker than Persona 4 Golden’s introduction. Don’t get me wrong. I heart P4G so much that it’s the reason I bought a VITA in the first place. But, man. That intro sequence just takes sooooooo freaking long to get going. Not so with Persona 5. You pretty much hit the ground running in Persona 5's plot due to an ingenious plot mechanic that I can’t recall ever being used in the series, let alone a JRPG. My memory wants to say Chrono Cross used this same mechanic, but it’s been a while since I’ve played that game so I’ll leave it to you to discover. Regardless, you have an immediate reason for why the initial plot threads ravel the way they do, which is a definite plus in my book. It’s such a positive that I can rarely pull myself away from the game when I do boot it up. That experience of losing time while losing a game has been a rarity for me, so when it happens, I have to be cognizant of my schedule, both in game and in real life. 2. That soundtrack. Oh, that soundtrack. I haven’t been able to get the opening theme out of my head since booting up the game last Tuesday. I hum it at work. I hum it in the shower. I hum it in line for coffee. I’ll probably keep humming it until I beat this game. But this is but a small snippet of the amazing music found in this game. I’ll leave it to you to discover the amazing music beats the game throws at you while you make your way through the plot, but this is definitely on my radar for a video game OST to pick up in the near future. 3. The cast of characters may be archetypes, but they’re interesting archetypes. You’ve got the loner, the troublemaker, the misunderstood beauty, the artist, the mascot, the junior detective, and the head of the class. We’ve seen these characters in previous Persona games. But Persona 5 twists the motivations of these characters in just the right way that they become wholly new characters while you work your way through the narrative. Ryuji could have been another rehash of Persona 4's Yosuke or Persona 3's Junpei, but once you get introduced to Kaneshiro, you realize that there’s some dark beats that Persona 5 is willing to go to that FES and Golden barely touched upon. And while Naoto was the shining beacon for junior detectives in Golden, there’s just something about Akechi that makes me uncomfortable. Maybe it’s just the way he introduces himself by saying something that he shouldn’t have been able to say (vague for spoilers, he said in a sing-song voice), or it’s the way his personality jumps between playful and serious, but he’s definitely got a Naoto/Adachi amalgamation going on with him, Regardless, just like in previous Persona games, Persona 5 has used the lessons learned from those installments to flesh out these characters and make you actually care about their plights, their successes, and their failures. They’re almost like real people. 4. The dungeons come in two varieties now. If there was a major complaint levied against Persona 3 FES and Persona 4 Golden, it was that, while the dungeons were randomly generated, they lacked any real character in their layouts. And while the major dungeons (called Palaces) in Persona 5 still fall into the “boxy” layout of previous games, the Palaces have much more character to distinguish one from another. Thus far, the Palaces have ranged from a castle to a museum to a bank, each with their requisite quirks when it comes to dungeon layout and traps within. But like the recent Breath of the Wild, Persona 5 also allows you to get your level grind on through Mementos. This is the randomly generated dungeon you’re used to from FES (Tartarus), but instead of climbing to the top, you have to get to the bottom of Mementos. And while I’m still early in the game, I can say that going into Mementos will most likely have a narrative climax since it seems tied to one of your party members. But while Mementos gives you the familiarity of previous Persona games with the randomness, the Palaces are fixed affairs that need the static layout due to the plot and motivation of your characters. Again, not saying too much here because of possible spoilers. 5. Confidants are the new Social Links. One of the main draws of any Persona game is the time you spend outside of dungeons and building relationships with party members and people you encounter along the way. And, luckily, the draw is even stronger than ever in Persona 5. You’ll want to pursue these relationships as soon as possible because the more these people trust you and care about you, the more perks you’ll get in battle, be that recovering from status ailments faster or being able to endure a fatal blow from an enemy. But the real draw is putting in the time getting to know these people better. Because until you max out these side stories, you really won’t know the true motivations of these characters. And just like Persona 4, I have a feeling that you won’t be able to get the best ending if you don’t spend time with your friends. So, just do it. After all, what’s wrong with stopping to eat a bowl of ramen with your friends? 6. If you want to play Persona 5 for the story, the game will let you. Can’t believe I forgot this the first time around, but yeah, if you want to invest in Persona 5 but feel daunted by the play length and/or difficulty, Persona 5 allows you a difficulty select option. But there’s an option solely for story called “Safe” mode. I haven’t tried it myself, but from what I’ve read, it nerfs enemies while doubling your party’s damage. Also, you’ll get a lot more experience points and money in this mode. So, if you want to tackle Persona 5 but wary about the difficulty about going through it the first time around, “Safe” is definitely an option. However, be aware that if you choose this option, you can’t switch the difficulty later on down the line like the other options. But, that’s what new game plus is for, right? If you’re a fan of JRPGs and thought that you’d never experience a sprawling epic on a major console again, then look no further than Persona 5. It’s been roughly ten years since Persona 4, but apparently those ten years have been worth the wait. 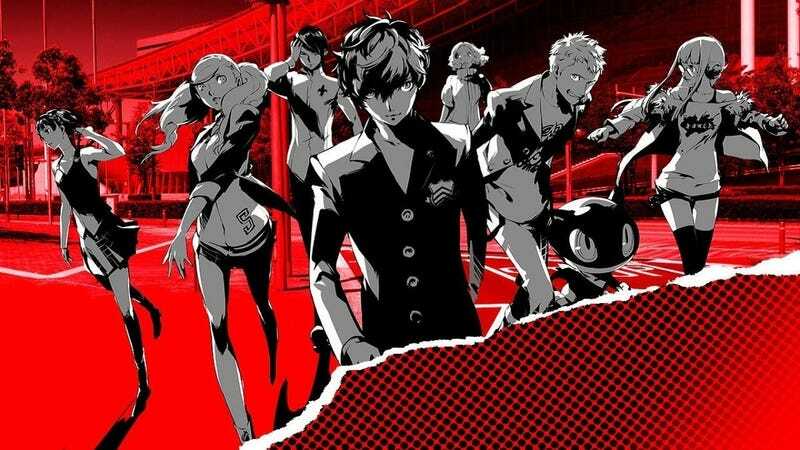 This might be a Japanese renaissance, what with Breath of the Wild, Yakuza 0, and Nier Automata currently out, but if you’re looking to get lost in one game this year, I can wholly recommend Persona 5 based on my twenty-something hours with the game. It was enough to get me to put down Breath of the Wild. And while I will eventually work my way back to Link’s quest, I’m more invested in Persona 5's cast of characters and their immediate plight. Because I want to see them get through all of this darkness and hopefully end up on the other side with a happy ending. Only time will tell, but I can honestly say that I’m willing to invest the time. Even if it takes me another hundred or so hours to get there.